This is a goodie...I guess I should say a(nother) goodie. I’m really excited about this one for so many reasons, but mostly because it’s a great lesson in vintages. Back in September, I offered this exact same wine in the 2012 vintage (you can refresh your memory on that offer here), and it was a tremendous hit. 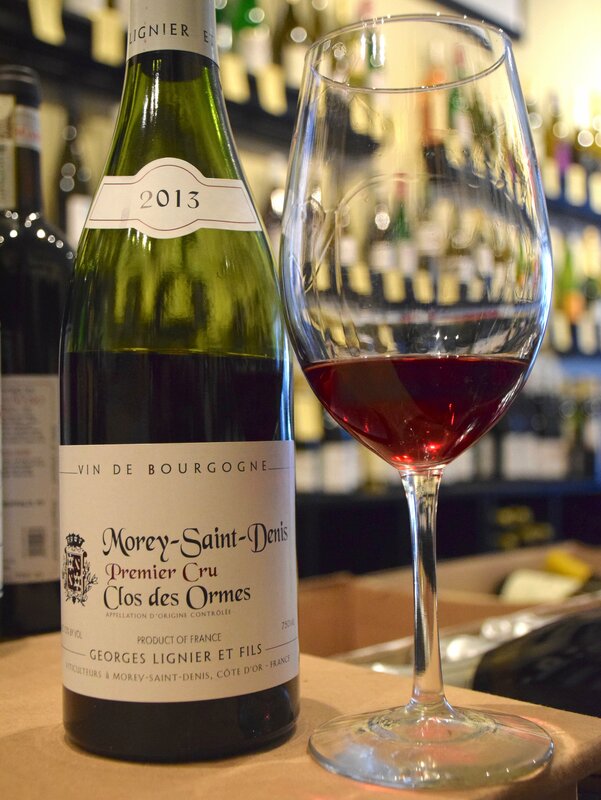 I had a bottle of this 2013 vintage of Georges Lignier Morey Saint Denis 1er Cru Clos des Ormes last week and I’m as excited (if not more excited) for it as I was for the 2012. Where the 2012 was dense and supple, with an epic level of pure, Vosne-like red fruit, this 2013 is much more recognizable as a classic Morey. This is due to its much more transparent character, something that, for me, is a hallmark of the vintage. The nose blossoms with all manner of perfumed, darkly-accented fruits and lovely notes of wild flowers and savory, metallic minerality. The nimble and very crystalline personality continues on the palate with all manner of floral, spicy and mineral notes. Don’t interpret 'nimble' as 'wimpy', though. The clear delineation belies its fantastic structure of acidity and fine tannins -- it's actually a fairly burly wine, especially in the context of the vintage. With each glass (each whiff, even), the wine continues to shift and evolve and reveal more and more of that classic Morey character. If you can keep your hands off of it, this Ormes 2013 will evolve beautifully over the next decade plus, and I personally can't wait to see where this is at in 7-10 years. Georges Lignier might be the great value in the Cote de Nuits right now. His wines are elegant, concise and very authentic, and they're priced well below many comparable producers in the region, including his cousin Hubert. If you’re someone who’s looking to have some fantastic Burgundy on hand to drink, this is for you. If you’re someone who’s hoping to get some great 1er Cru Cote de Nuits juice in your cellar for well-below the $100 mark, this is also for you. Let’s face it, if you love great wine...this is for you. ...I don’t know how else to say it.